Welcome, Joan Holub and Suzanne Williams! I'm just back from an incredible SCBWI conference in Los Angeles, and to keep the good feeling buzzing along, am posting an interview with Suzanne Williams and Joan Holub, two of our colleagues. Joan has moved on to a new region, but she'll always be among my favorites because she was the first person I ever spoke to at an SCBWI conferen Ooh! Swag!ce. I'd just made it through the lunch line at Seattle Pacific University, and was having cafeteria palpitations. Joan looked friendly enough to approach, and even though she was an author and illustrator with a library of books under her belt, she took the time to encourage me, and she didn't seem to mind my table manners at all. Suzanne is someone I had the good fortune to meet once I was settled in the SCBWI. She's a model of generosity and affability, and her books are tops. Together, she and Joan are goddesses. 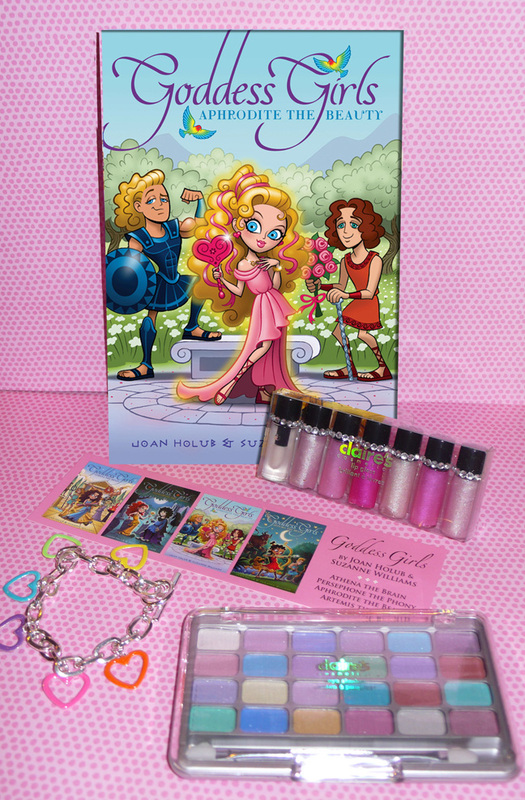 To celebrate the release of their latest collaboration, Goddess Girls #3, Aphrodite the Beauty, Joan and Suzanne were kind enough to answer a few of my questions. What inspired you to write the Goddess Girls books? Suzanne: The series was Joan’s idea. She’d always been interested in mythology, and thought a “school-based” series starring tween goddessgirls and godboys would be fun to do. She was right! Joan: Suzanne and I used to have dinner together regularly when I lived in Seattle, and we talked about books all the time. I respect her w Joan Holubork and thought it would be fun to write with her, and it has been! We’re tossing around other ideas for future series as well. How are you doing your research? Joan: We use books like Edith Hamilton’s “Mythology” as sources for myths, as well as mythology dictionaries and on-line articles. I’ve got two shelves of mythology books because I love the subject. Especially Egyptian and Greco-Roman. We’re introducing an Egyptian goddessgirl in the 6th book as a side character. Suzanne: Our research is just the starting point, of course. We’ve had a lot of fun weaving the myths involving our four main characters into our stories, using those myths to play up themes (about friendship and boy-girl relationships, for example) that are of concern to our readers. How are you handling the writing between the two of you? A lot of people have dreamed of teaming up, but aren't quite sure how to chart the course. Do you have any tips? Suzanne: Pick the right writing partner! Joan and I both have strong work habits, compatible writing styles, and enough experience to allow us to put our egos aside for the sake of the writing. Suzanne WilliamsJoan: Well said, Suzanne. We weren’t sure how we were going to write together in the beginning. 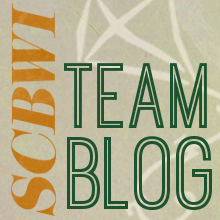 Some writing teams trade off chapters, but that seemed too unwieldy for us. Since we were initially contracted to write four books, we each did rough drafts for two, then traded the stories back and forth for several more drafts. Since I live in North Carolina and Suzanne is in Washington state we did all this through email attachments, using Microsoft Word’s Tracking feature to edit and comment on each other’s work. We also made many long phone calls. Our relationship has been very comfortable—no arguments. (Yay!) It’s so nice to have someone to turn to who’s equally invested in the success of the books. When I’m stuck for something humorous, I can ask Suzanne, and vice versa. Because we rewrite each other’s work so much, the series feels homogenous, as if written by one author. Our publisher, Aladdin, has recently asked us to write two more books for the series, so we’re each working on one more rough draft now. (Goddess Girls 5 & 6.) Lucky for us that they’ve always requested books in multiples of two! Which goddess are you most like, Joan? And what about you, Suzanne? Joan: I want to be Aphrodite! Who wouldn’t want to be the most popular, beautiful, likeable girl in school? But I’d also like to be Athena because she’s brainy; Persephone because, well, she’s got that bad-boy Hades in love with her; and Artemis is fantastic at every sport. So I’ll be greedy and take them all, rolled into one. Suzanne: Probably Athena. I studied pretty hard when I was in school and got good grades. But like Persephone, I’ve sometimes “gone along to get along” with others, ignoring my true preferences. There’s nothing wrong with that, of course. Compromise is a valuable skill. But I’ve learned that balancing my needs with the needs of others is also important. Oh, wow, that sounds heavy. Sorry about that! I’m probably least like the sporty Artemis and the beautiful Aphrodite. I was never into team sports, and I never had tons of guys vying for my attention. Darn! What kind of response are you getting from your readers? Has it been gratifying? Suzanne: Yes! I use Google Alerts to track on-line references to the Goddess Girls series. I’ve found several blogger reviews that way, including one from a dad whose eleven-year-old daughter devoured the first two GG books, then immediately asked him to put the others on reserve at the library as soon as they were available. That kind of reaction is music to Joan’s and my ears! Suzanne and Joan: We hope that reviewer is right because we LOVE writing the series! Thank you for letting us visit today, Martha! And thank you for visiting! I am such a fan of both of you and your many books. Aphrodite the Beauty (ages 8-12, releases August 3, 2010, Aladdin paperbacks) ISBN: 978-1416982739 Sure Aphrodite is beautiful, but being the goddessgirl of love is not always easy. Though others think she’s an expert on boy-girl relationships, they’re often just as confusing to her as to anyone else. And she certainly never thought she’d find herself jealous of one of her best friends! Finding out she’s a goddess and being sent to Mount Olympus brings Athena new friends, a weird dad, and the meanest girl in mythology—Medusa! Hiding her feelings works fine for Persephone until she meets a guy she can be herself with—Hades, the bad-boy of the Underworld. Giveaway details: Drop a comment to be automatically entered for a chance to win: Contest is open to USA only. Open to all ages. Contest runs from August 4 – August 8. One winner will be randomly chosen and announced here on August 9. Aphrodite the Beauty Swag Bag will be mailed out within 10 days of receipt of address from winner.